This is how I annotate rules changes. I've been pretty busy these last few days with parental care problems and the finishing of my son's pinewood derby car. But now I'm back to preparing for the next round of testing. Which means formalizing exactly how this whole floating initiative system is going to work. While working on the stats for the test units, I've also taken a stab at unit costing in Excel. Coming up with first-approximation costs for each characteristic value. Each one except Initiative, that is. Because I don't really have a good idea yet of just how much of an quantifiable advantage it is to move after, or shoot before, another unit. Since I didn't feel like figuring it out, I decided to try and balance those differences another way. By starting every unit in the game off on the same (or nearly so) Initiative level, and letting their actions/hits/casualties determine the differences as the game progresses. Our Initiative Baseline would be 6. This is where the defender's initiative would start. All attacking units would start at initiative 8. At The Doubling would decrease Initiative by 1. So if the attacker runs, and the defender holds, they would both be at Initiative 7. The attacker would still have the advantage, but only if they don't take too much fire. 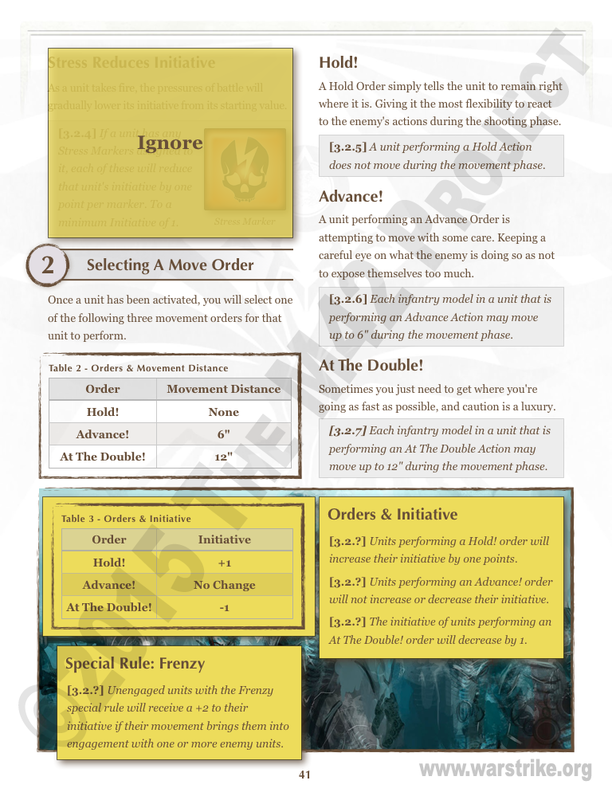 This forces the attacker to be more aggressive, and the defender to spend at least the first few turns conserving their Initiative. Until the hits and casualties start breaking up the order of play between the sides. This also allows for some interesting special rules. Such as Frenzy increasing the Initiative of a unit that successfully moves into melee engagement with an enemy unit.